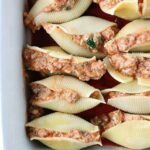 Lasagna Stuffed Shells. This easy dinner recipe is made with sausage, ricotta cheese, spinach, and your favorite pasta sauce! Perfect for busy weeknights or to stick in your freezer. This recipe is my FAVORITE. It has everything you could ever want in a comfort food dish. And it is easy. Easy recipes are coveted in my household. The last thing I want to do after a long day of work is come home and spend hours in the kitchen. This one takes a whopping 30 minutes to whip up. Did I mention it is also freezer friendly? Pre-shredded cheese does not tend to melt quite as well. With the fresh version you get that ooey gooey melted cheese that you always see in restaurants. You can also try substituting Italian sausage for a breakfast or spicy variety to change up the flavor profile or leave the meat out all together. We make a double batch and put half into disposable tin pans. Cover tightly with heavy duty foil, label, and place in a zip top bag. Freeze until you are ready to use. Pull it out when you’ve got nothing on the menu and the family is begging for something delicious. I suggest leaving it in the refrigerator overnight to slightly thaw. Follow the baking directions from there. We also use this same idea to take meals to friends and family when they need a little extra something (think new babies, surgeries, birthdays…). Like this recipe? You will love my Thanksgiving Stuffed Shells, Chicken Alfredo Stuffed Shells, and Mozzarella Stuffed Meatballs! 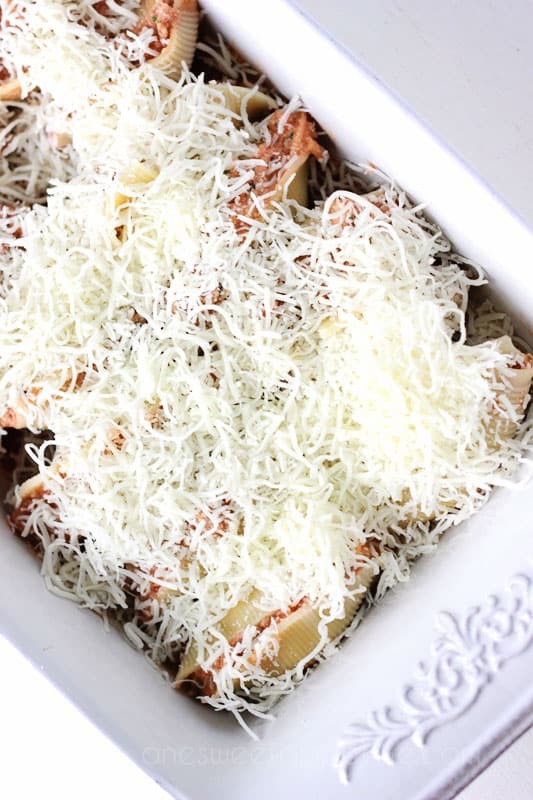 Baked pasta is one of my new go-to’s thanks to this dish! I like to serve it with a light salad (think Olive Garden style) and a little bread! Try slicing a store bought french loaf- slice it thick, brush on a little butter, and sprinkle with some chopped green onions. Wrap that sucker in tin foil and toss in the oven for 15 minutes or until it is nice and toasty. Bring a large bottle of water to a boil. Add your pasta and cook according to the package directions. Drain the noodles and set aside. Preheat your oven to 350 degrees. Spread 1/2 cup of your tomato sauce in the bottom of a 9x9 dish. Add the uncooked sausage to a hot pan and cook until browned. Stir in 1 cup of your tomato sauce and set aside. In a small bowl stir together the ricotta, 1/2 a cup of mozzarella, Parmesan, egg, and spinach. Stir the mixture in with your sausage. Spoon a hearty amount of the filling into each shell. Place into your prepared baking dish and continue until all are filled. Smother with the remaining 1/2 cup of sauce and generously sprinkle with mozzarella. Cover with foil and bake for 20 minutes. Uncover and continue to bake for an additional ten minutes or until the cheese is melted and bubbly. Follow the instructions above until just before baking. Cover securely with heavy duty foil or a freezer container. 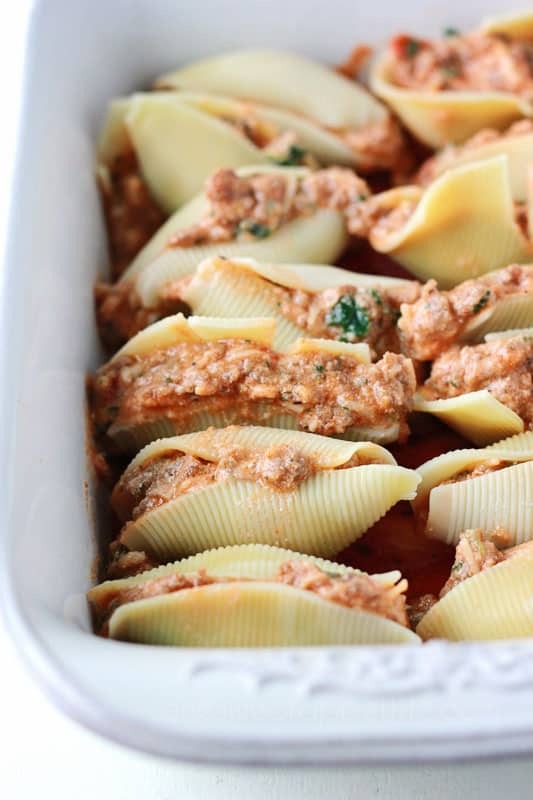 Take your stuffed shells out of the freezer the day before you plan on cooking them. Let them slightly thaw in the refrigerator. Bake at 350 degrees, covered, for 45 minutes. Remove the foil and bake an additional 20 minutes. 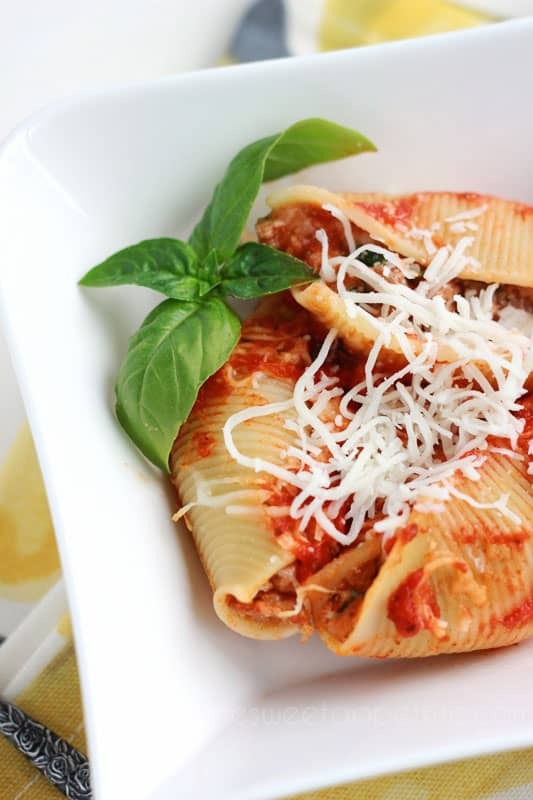 *If you like a more saucy pasta, add 1 extra cup onto your shells. This is also a good idea if you plan on freezing these for later. This looks delicious. It would be a great recipe to take to a new mom too. I’ll definitely have to store this in the “must try” pinterest board, because we always need new meals to add to our rotation. So glad you participated in Point of View! Mmmm! Yum! I’ll have to find some gluten free shells to try this. It looks delicious! Yummm! This sounds so delicious! Pinning to try soon! I Love to hear that people enjoy my recipes!! Yum! Made this for lunch today. This recipe is a definite keeper! Thanks. Just made these. Subbed in ground turkey with italian seasoning and left out the mozza (because I didn’t have any on hand). So good.. so easy… so my work lunch tomorrow! Love how versatile this recipe can be and look forward to adding other goodies to the mix. Thx!! These are the types of comments I live for! Love that you enjoyed the meal and your changes keep things simple and delicious! Do you think you could make this and freeze it? Of course! We normally freeze half before baking and pull it out on another day. It’s the perfect freezer meal! We are making this tonight for the missionaries in our area! So far so good! We are baking them now! Gathered my stuff to make and reread the recipe….after you put the meat mix in the shell I assume you then put the cheese mixture on top of it. But it doesn’t say that. About how much cheese mix goes in the shell. I think I can figure this out….making it for a birthday dinner…..looks good. Spread 1-2 teaspoons of the cheese mixture into your cooked shells. Top with a heaping scoop of the meat. Place in your pan and follow the remaining directions from there. We’ve tried several different store brands. I like Giada’s. You can find it in target and it comes in different flavors. Hey there! This recipe looks delicious, and I can’t wait to try it!! I was just wondering if it’s okay to freeze it before baking? I’m trying to find good freezer recipes, and I would love to add this to my collection! i am making this now but used hamburger instead and added Lipton onion soup mix to it. Can’t wait to try it. Hi Deidre! I ground the sausage while cooking it in a skillet. Good luck! It was DELICIOUS!! Thank you!!! Bake covered? Meaning tin foil will work? Yes, tin foil will work. So glad you loved it. It’s still one of our family favorites. I came across these on Pinterest. They were absolutely DEVINE! My Husband and I both went back for seconds, not that we needed them. Thank you for a great recipe! Instead of using sausage I used beef. Flavored w Italian seasoning & mrs dash. It turned out well! Thanks for the easy recipe. Made this tonight for my boyfriend and I and it was so yummy!! Definitely making this again! Made these last night and they were GREAT! I subbed cottage cheese for ricotta (because that’s just what I had). Next time I make these (oh yes, there WILL be a next time!) I will mix the meat and cheese mixture simply to save a round of filling. Oh, and I had to use a 9×13 pan to make them fit. We’ve substituted cottage cheese a few times as well! So happy you liked the recipe. I can’t wait to try these but is there something I can substitute the spinach for or can I just leave it out? I have a very picky husband and kids and they won’t eat these with the spinach but will gobble them up without. These look absolutely divine. You can leave it out. We have in the past without any complaints. A lot of the flavor will come from the sausage and sauce. These were delicious! I added half an onion, fresh spinach, and italian seasoning! I will be making these again! Thanks for the recipe! I never thought to add onion! Great idea and love that you used fresh spinach! Hi, I was wondering how long would you add to the baking time if doing it from frozen? I like to pull it out of the freezer the day before and keep it in the refrigerator so it can thaw a bit but if you forget I would add 20 minutes to the baking time or cook until heated through. Silly question.. what kind of parmesan? Grated or shredded? Not silly at all! I use shredded. Delicious!!! What’s the best way to cook them from the freezer? We pull them out of the freezer and leave them in the fridge overnight. Bake them as normal. Or add an additional 20-30 minutes if cooking from frozen. Hey if I use one pound of ground beef should I use one egg or two eggs? I made this using a mix of beef and Italian sausage and no spinach. I also double the cheese filling. This is my go to stuffed shell recipe! Absolutely delicious every time! Thank you so much for sharing, Jaqueline! My husband agrees with you on eliminating the spinach. I love the combination of both the beef and Italian sausage! Great idea. Holy cow these are yummy! Made them for a dinner party and everyone was asking for the recipe! I did substitute ground hamburger for the sausage because it was what I had on hand. Make this recipe probably once a month. Figured I should leave a review. It is SO EASY. We add chopped veggies like zucchini and sometimes broccoli. super good. thanks for sharing! Do you use plain canned tomato sauce? Not a marinara sauce? Good question. I use my favorite canned spaghetti sauce. I will update that in the recipe. Excited for you to try it! We actually had it last night! Just made this using ground venison!! Turned out awesome!! What an interesting idea! We will have to give it a try.